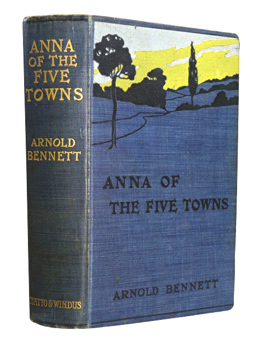 BENNETT, Arnold (Enoch Arnold), 1867-1931 : ANNA OF THE FIVE TOWNS : A NOVEL. London : Chatto & Windus, 1902. First edition. A young woman struggles for freedom and independence in the Potteries – “There is excellent material in every character, and the grip of circumstance is strong and capable. Indeed, the picture of ‘The Five Towns’ with the life of prosaic labour, into which the mystery of romance yet creeps, is not only admirable but beautiful” (Contemporary review in The Pilot). Crown 8vo (20cm). [viii],360 + 32pp advertisements dated March 1902. Original pictorial cloth, gilt and enamelled; top edge gilt; some minor rubbing and light wear; some spotting and browning, mainly to edges, endpapers and prelims, but still overall a very good copy of a difficult title. With the contemporary ownership inscription of H. B. Money-Coutts – Hugh Burdett Money-Coutts, Sixth Baron Latymer, J.P. (1876-1949), author and poet, who served at Gallipoli and in Egypt in the Great War. 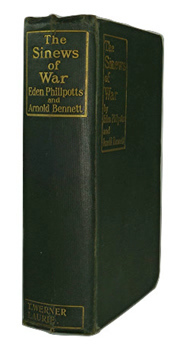 PHILLPOTTS, Eden, 1862-1960 & BENNETT, Arnold (Enoch Arnold), 1867-1931 : THE SINEWS OF WAR : A ROMANCE OF LONDON AND THE SEA. London : T. Werner Laurie, . First edition. Their first collaboration – “That monster, London, was just lying down to rest. The clocks of the Strand churches and the Strand hotels, keeping nocturnal vigil, showed a quarter to one under the February moon ...” – later published in the USA as “Doubloons”. Crown 8vo (20cm). viii,344pp. 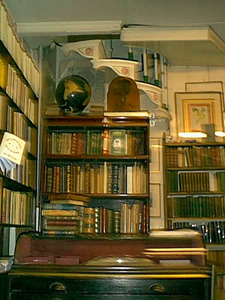 Original green cloth, ruled and lettered in gilt; lightly worn and bruised; tiny nick at foot; a little shaken and slack; front free endpaper torn and slightly defective; rear endpaper a little cracked; some spotting, mainly of prelims and edges; a few internal chips and small flaws, but a reasonable copy of a difficult title. 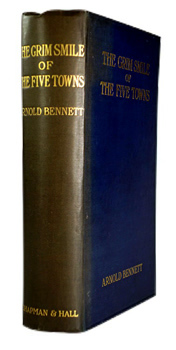 BENNETT, Arnold (Enoch Arnold), 1867-1931 : THE GRIM SMILE OF THE FIVE TOWNS. London : Chapman & Hall, 1907. First edition. Signed by Arnold Bennett on the front free endpaper. A collection of thirteen bitter-sweet short stories of the Five Towns, all but one previously unpublished. Includes “Baby’s Bath”, “The Silent Brothers”, “Vera’s First Christmas Adventure”, “The Murder of the Mandarin”, etc. Crown 8vo (19cm). [viii],302,[x]pp – the integral advertisements not noted by Emery. Original blue cloth, ruled in blind and lettered in gilt; mild wear at head; a little sunned; a few faint marks; a few spots to prelims, but a good copy of a difficult title. 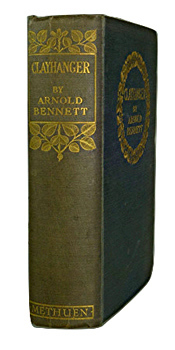 BENNETT, Arnold (Enoch Arnold), 1867-1931 : THE OLD WIVES’ TALE : A NOVEL. London : Chapman & Hall, 1908. First edition. Bennett’s celebrated chronicle of the lives and times of two contrasting sisters. “There is nothing, therefore, surprising in the fact that, in the longest novel he has yet essayed, Mr. Arnold Bennett should have scored his most complete success. We are not sure, indeed, that publication ... does not give its author an entirely new place among contemporary novelists” (Daily Telegraph, 2nd December 1908). Crown 8vo (182 x 114mm). viii,578pp. Bound in an elegant recent half red morocco; a few minor marks and spots, but a very good copy of a notoriously difficult title. BENNETT, Arnold (Enoch Arnold), 1867-1931 : CLAYHANGER. London : Methuen & Co., (1910). First edition. The first (and scarcest) of the Clayhanger trilogy – Edwin Clayhanger comes of age in the Five Towns. With the advertisements dated August 1910. Crown 8vo (20cm). (viii),(576) + (32)pp. Original blue-green coloured cloth, blocked and lettered in gilt on upper cover and spine; minor wear and nicking at tips; slightly sunned, lightly bruised and a touch marked; endpapers neatly rejointed; mild spotting of prelims, but a good copy of a difficult title. With the 1920 ownership inscription of Viola Duckworth, née Davies-Evans (1871-1944). Emery 7. 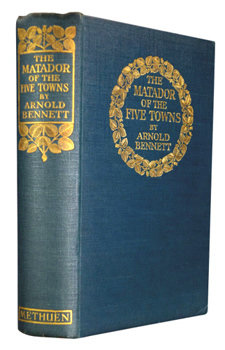 BENNETT, Arnold (Enoch Arnold), 1867-1931 : THE MATADOR OF THE FIVE TOWNS AND OTHER STORIES. London : Methuen & Co., 1912. First edition. A fine collection of twenty-two stories from Bennett – some tragic some frolic – including “Mimi”, “The Letter and the Lie”, “Catching the Train”, “The Widow of the Balcony”, “Hot Potatoes”, “The Tiger and the Baby”, etc. Crown 8vo (20cm). (viii),(326),[ii], + (32)pp advertisements dated September 1911. Original decorative cloth gilt; spine just a touch dulled; one corner a touch bruised; some spotting of edges, but a very good copy. BENNETT, Arnold (Enoch Arnold), 1867-1931 : MR. PROHACK. London : Methuen & Co., (1922). First edition. A Treasury civil servant suddenly finds himself immensely wealthy – money and the 1920s. “Like an oyster waiting the pearler’s knife the whole of idle London lies ready to Mr. Prohack’s – and to Mr. Bennett’s – attack. And that attack when it comes is leisured, penetrating, ruthless in its gentle laughing effectiveness ... In and out of the story weave the strands of Mr. Bennett’s effective humour, subtle in its apparent superficiality; ironic in its low-toned laughter; satiric in its finely pointed epigram ...” (Yorkshire Evening Post, 6th May 1922). Crown 8vo (20cm). (314),[ii]pp + 8pp advertisements. Original blue-green cloth, blocked and lettered in blind on upper cover; ruled, blocked and lettered in gilt on spine; just a touch of wear and mild bruising; a few slight marks; endpapers a little tanned; some spotting of edges, but a very good and bright copy.